Let's face it, buzzards are not birds with lofty reputations. They are filthy and impure symbols of decay. They gorge themselves on putrid flesh, readily urinate on their legs, and use vomit as a first line of defence when threatened. Pretty disgusting! Sure, it looks bad but these poor birds deserve a lot more respect than they are given. Vultures or Buzzards are actually related to the noble Eagle. These poor birds may have some nasty habits but if we took the time to see vulture through new eyes, we would appreciate them for being clever creatures. We often see buzzards as lazy bums who spend their time sleeping the day away, but after having a massive meal, wouldn't you? Vultures gorge themselves simply because the next meal for a scavenging animal is never certain and after a hearty fill, it is only nature for the body to slow down in order to aid digestion. Even you do it after pigging out on a huge dish. Sadly, this image has resulted in the birds often being portrayed in cartoons and other media as sleepy, lazy animals. Vultures are also emblems of Motherhood and Creation. It sounds shocking and it is doubtful that Hallmark will print Mother's Day cards with the sprawling image of a vulture any time soon, but these winged creatures were once revered as the perfect example of Femininity and Motherhood. Vultures are known as fiercely protective and extremely doting mothers in the wild, but most people are too repulsed by their other unsavoury habits to take notice. In ancient Egypt, the goddess of Motherhood, Mut, was revered as the Queen of the Goddesses and the World Mother. Mut is often depicted in sacred scriptures with a regal headdress shaped like a vulture in flight and the first hieroglyphic in her name is the image of a vulture at rest. She is the doting mother from which the universe was created. The Egyptians weren't the only ones to hold these misunderstood birds in high regard. In the Mayan tradition, the King Vulture was the ultimate connection to the spirit world. Seeing one soaring on the wind meant that your prayers were being carried to heaven. King Vultures were believed to have healing powers and the bird's blood and feathers are still integral ingredients in healing potions throughout much of South America. Some species of vultures, namely the Andean Condor were worshipped as Sun deity and their bones and organs were used in many healing concoctions. Even to this day, the respect for this species is alive and well. Several South American countries have official stamps, seals, and other government documents depicting these vultures in positions of power. Mayans also saw the Vulture as a totem of Renewal. Through their eyes, the Vulture gained a lofty status not only as a Harbinger of Death, but also as its enemy. Vultures could devour Death (literally) and continued to thrive and flourish after the fact. In a sense, the Vulture embodied the Wheel of Life, instilling in the Mayan psyche the idea that Life emerges from Death and that Death exists because of Life. This is a chicken and the egg scenario, in a sense, because they are both the Cause and the Product of their own existences. This idea of Healing and Renewal extends beyond the Mayan empire and reaches deep into the Native American culture. In their eyes, the Vulture was seen as a solar totem and their idea of Renewal is intricately intertwined with the regular cycle of the Sun and the Moon. The bird's morning habit of standing for long periods with its wings fully spread in the morning sun also gives weight to this view of Renewal. For them, the Vulture spreads its wings to welcome the day and embrace the newness of Life. Buzzards are also a sign of Luck and Prosperity in Iranian mythology. The exotic and extremely rare Lammergeier or Bearded Vulture is an extension of the sacred Huma and folklore states that the shadow of a Huma in flight will brings blessing and luck to whoever it falls on. Are you that lucky gal or guy? Vulture Tattoos are notoriously unpopular designs. Who wants to walk around sporting a permanent image of a vilified and vile creature? 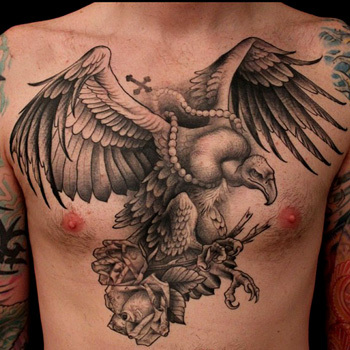 Should you opt to get the image of a vulture on your body, the most popular designs are tribal tattoos and carton ones. Tribal designs have a deep spiritual connection whereas the Carton Vulture tattoos speak to your rebellious side and your opposition of the status quo. If you are a rebel at heart with an eye for the peculiar, then a Vulture Tattoo may just the design for you. These designs help to channel your views and let the world know that, like the Vulture, you are underappreciated and misunderstood. Be as creative as you wish in your design but be prepared to face the awkward stares and whispers that having such a tattoo may bring. Creating a unique design can be a daunting task, but the team at www.itattoodesigns.com is more than happy to help. Visit our design page and take advantage of our Custom Design Service.